Master Jet has forgotten to complete his homework… or has he? Jet’s teacher is surprised to find that instead of the alphabet, his page is completely blank. Jet tries to explain that it really isn’t his fault. After all, how can he help it, if none of his letters want to stay on the page! 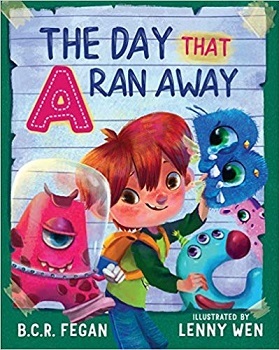 The Day That A Ran Away is an amusing story about a little boy named Master Jet. Master Jet is an imaginative boy, who has found himself in quite a predicament—his homework is incomplete and it’s not his fault. As he explains to his teacher, for one reason or another, the letters have all disappeared from his book, gone off on their merry ways, and he doesn’t know when they’re coming back! In a new and clever rendition of the alphabet, Fegan has written a lively rhyming story that will have children giggling in their seats. I know I sure did. The short, two-line rhymes are catchy and fun to recite during a read aloud. They also make it easy to teach children how to identify rhythm and repetition in literature. Another cute and educational element that is sure to engage young readers is searching through the pictures for the hidden items beginning with each letter. Wen’s charming illustrations match the story perfectly and add a splashy playfulness to the fun-spirited nature of the book. A visual delight, the letters are depicted as monsters, whose expressions and hilarious antics, will have young readers cheering to view and hear the book again and again. This is one book I would enjoy reading to children several times over. As an early childhood teacher, I would give Master Jet, Fegan, and Wen each an A+ for their skills in successful collaboration, their sense of humor, and their ability to entertain readers. I give it four shiny stars!